Carol Styles-Baylor, left, gives praise at the 34th annual Archdiocesan Gathering in honor of Rev. Dr. Martin Luther King Jr. on Monday, Jan. 16. The 34th annual Archdiocesan Gathering in honor of Rev. 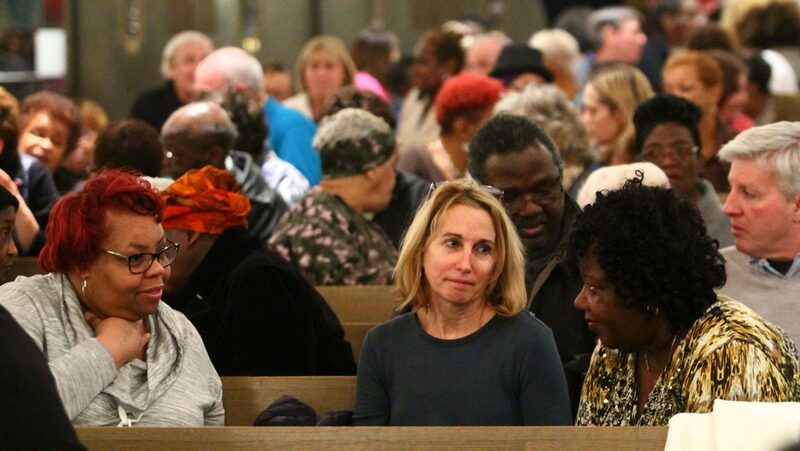 Dr. Martin Luther King Jr. had the theme of “A Dream in Black and White: Growing in Understanding as Catholics.” Every pew was filled in St. Philip Neri Church in Lafayette Hill, the venue for the gathering. Presiding over the prayer service that drew all races from around the Philadelphia area was Auxiliary Bishop John J. McIntyre, along with other priests and deacons. Twice during the program the congregation stood up in standing ovations after the testimony of a black man and a white woman. The second nearly as strong ovation occurred for the final speaker of the evening, Ann Menna, who is deputy secretary for Catechetical Formation for the archdiocese and a member of Our Lady of Mount Carmel Parish in Doylestown. She shared an anecdote of the time she had to reflect on her own unconscious racial bias even though she never considered herself racist. Once while she was shopping with her young children she became fearful of a young African American man who was staring at her. She actually thought of how she would get away from him. When he followed her down the aisle, and then stood in front of her she became extremely terrified. 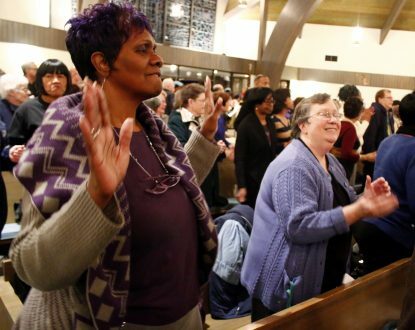 Those in the pews were also challenged to consider the anthem of the civil rights movement, “We Shall Overcome.” The lyrical phrase, “black and white together” was not the case at St. Philip’s, according to Father Christopher M. Walsh, pastor of St. Raymond Parish in Philadelphia, who served as the master of ceremonies. “I see all the blacks sitting with blacks and the whites sitting with whites,” he said. So he encouraged the crowd to get up and change seats so that all the pews were integrated. This came in handy for the seated discussion questions that would later be part of the evening’s agenda. The first question dealt with the change of administration in Washington and what the people would tell President-elect Donald Trump needed to be worked on first. After Moses’ remarks they reflected on the question of whether African American lives mattered. Finally after Menna’s anecdote they discussed whether they harbored any biases. The program opened with a half-hour long musical prelude featuring the Philadelphia Catholic Mass Choir, followed an interpretative dance by the Immanuel Movement Praise Team. Choreographed by Stacy William and Antoinette Reaves of St. Malachy Parish in North Philadelphia. After a reading from Scripture speakers addressed the congregation including Marq Temple, a parishioner of St. Athanasius Parish in Philadelphia, who shared his experiences working at the Juvenile Justice Services Center. Also present was Danielle Guess, a member of the nondenominational Church of the Savior in Wayne. She was seated in the front row with her young children and other family members, including one who was a member of St. Philip Neri. For Roy Kerr, a member of St. Raymond Parish, Moses’ testimony resonated with him. He shared what he felt with a couple from St. Philip Neri who were seated next to him and his wife, Patricia. Rhonda Ross, who readily admitted she has not attended Mass regularly since her former parish, St. Therese of the Child Jesus in Mount Airy, folded. But for her the Archdiocesan Gathering was edifying, and she said the unity of the crowd inspired her to recommit to attending Mass regularly. Those in attendance will be able to participate in an ongoing series of discussions titled “A Conversation in Black and White: Continuing the Conversation” scheduled to kick off at St. Raymond of Penafort Church, 1350 Vernon Road in Philadelphia’s Mount Airy section on Tuesday, Feb. 28. The series will then be held at St. Athanasius Church, 2050 East Walnut Lane in Philadelphia’s West Oak Lane section on Monday, March 13. The following session will take place at St. Barbara, 5351 Lebanon Avenue in West Philadelphia on Monday, April 10. Everyone in the congregation sing along to hymns led by the Philadelphia Catholic Mass Choir at the 34th annual Archdiocesan Gathering in honor of Rev. Dr. Martin Luther King Jr. Jan. 16 at St. Philip Neri Church, Lafayette Hill.